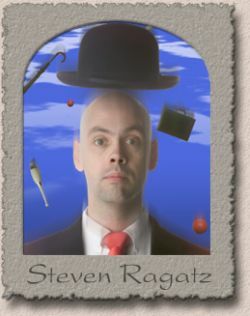 Hailed by the San Francisco Examiner as “impressive,” Steven Ragatz has been entertaining audiences with his juggling, physical comedy, circus arts and general antics for the past three decades. As a ten year veteran of Cirque du Soleil, Steven has toured throughout North, South and Central America as well as Asia and Europe performing multiple juggling acts and an eclectic array of characters. His television appearances include juggling on The Tonight Show, The Rosie O’Donnell Show and The Today Show. He has enjoyed holiday season appearances with the Indianapolis and Detroit symphonies juggling in front of live orchestras. Most recently, Steven has been touring internationally with Cirque Mechanics’ Birdhouse Factory and Boom Town, touted by Spectacle Magazine as “The most important contribution to the American circus since Cirque du Soleil!” Steven holds a B.A. in Variety Theater and an M.S. in Computer Science from Indiana University. He studied mime, stage movement and circus arts with Fred Garbo, Tony Montanaro, George Pinney, and Michael Moschen. He and his wife, Lisa, have two children, Melissa and Andrew, and currently reside in Bloomington, Indiana.